I was absolutely fascinated when I came across today's shop, and I have a feeling that you will be too! I have very little experience with polymer clay other than the colorful disk-like beads that you occasionally find here and there in craft shops. It's one of the mediums that I've just never tried to experiment with. I'll tell you what though... Madeline over at beadsCraftz has this down pat. Just look at the bracelet in the picture to the right if you don't believe me. Have you ever seen anything so beautiful and intricate and just... perfect? I haven't. I can't even imagine the amount of time and effort put into making this piece and many others like it that are offered over at Madeline's shop. Madeline is a self taught polymer clay artist that has spent a lot of time experimenting to achieve the best results possible for her craft. All of her beads are made from Premo or Sculpey clay, which are both artist grade polymer clay. The use of this clay combined with Madeline's image transferring techniques create some truly stunning results that you can clearly see in the variety of pieces she has to offer. This is definitely one shop you don't want to miss... so go check out beadsCraftz and take a browse through Madeline's beautiful gardens. You'll be happy you did! YOU CAN CLICK ON THE PICTURE ABOVE TO VISIT BEADSCRAFTZ'S SHOP OR, IF YOU PREFER, CLICK RIGHT HERE. I have been wanting to work with polymer for a while and this is only making me want to more. What a beautiful shop! There isn't one thing in there that I don't find gorgeous! Love, Love and love this shop, I admit I too am a blogaholic and this is one of my favorite stopping spots because you have such a talented eye for talent. Gorgeous! 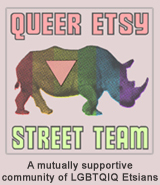 Thanks for calling attention to this great shop! 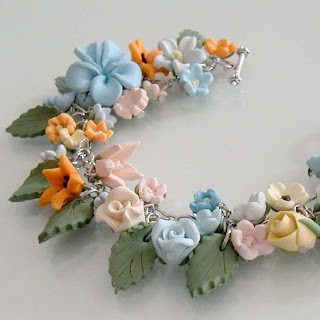 That is beautiful work with polymer clay. I love crafts that showcase how it can be used to make pieces that are elegant and sophisticated, not just cute and fun.